Author(s): Satish Patel, Vikas Sharma, Nagendra S. Chauhan, Mayank Thakur, V.K. Dixit. Department of Pharmaceutical Sciences, Doctor Hari Singh Gour Vishwavidyalaya Sagar - 470 003 (M.P.) INDIA. 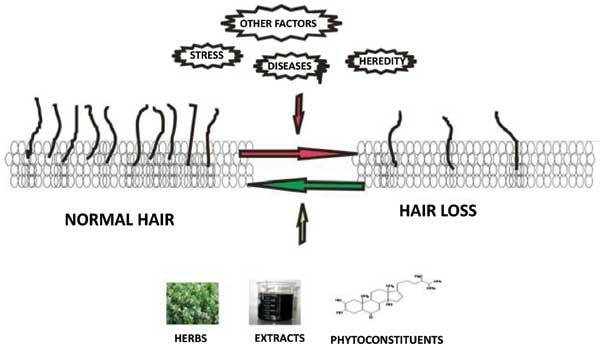 This review presents an overview on plants identified to possess hair growth activity in various ethno-botanical studies and surveys of tradition medicinal plants. It also highlights the developments in hair rejuvenation strategies from 1926 till-date and reviews the potential of herbal drugs as safer and effective alternatives. There are various causes for hair loss and the phenomenon is still not fully understood. The treatments offered include both natural or synthetic products to treat the condition of hair loss (alopecia), nonetheless natural products are continuously gaining popularity mainly due to their fewer side effects and better formulation strategies for natural product extracts. Plants have been widely used for hair growth promotion since ancient times as reported in Ayurveda, Chinese and Unani systems of medicine. This review covers information about different herbs and herbal formulation that are believed to be able to reduce the rate of hair loss and at the same time stimulate new hair growth. A focus is placed on their mechanism of action and the review also covers various isolated phytoconstituents possessing hair growth promoting effect. Keywords: Alopecia, ayurveda, hair, herbal formulation. Affiliation:Department of Pharmaceutical Sciences, Doctor Hari Singh Gour Vishwavidyalaya Sagar - 470 003 (M.P.) INDIA. Keywords:Alopecia, ayurveda, hair, herbal formulation. Abstract:This review presents an overview on plants identified to possess hair growth activity in various ethno-botanical studies and surveys of tradition medicinal plants. It also highlights the developments in hair rejuvenation strategies from 1926 till-date and reviews the potential of herbal drugs as safer and effective alternatives. There are various causes for hair loss and the phenomenon is still not fully understood. The treatments offered include both natural or synthetic products to treat the condition of hair loss (alopecia), nonetheless natural products are continuously gaining popularity mainly due to their fewer side effects and better formulation strategies for natural product extracts. Plants have been widely used for hair growth promotion since ancient times as reported in Ayurveda, Chinese and Unani systems of medicine. This review covers information about different herbs and herbal formulation that are believed to be able to reduce the rate of hair loss and at the same time stimulate new hair growth. A focus is placed on their mechanism of action and the review also covers various isolated phytoconstituents possessing hair growth promoting effect.